Jumping off tall objects for fun: yea or nay? Are you an adrenaline junkie? Do you like pushing yourself beyond limits of comfort (and possibly sanity)? Do you enjoy the sound of your own panicked shrieking? Are roller coasters just not cutting it for you these days? 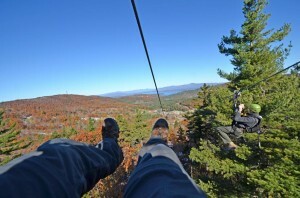 If the answer to any of these questions is an enthusiastic “Yes!”, may I suggest a ride on the longest zip lines in the continental U.S., at the Gunstock ski area in New Hampshire. My idea of big adventure does include a bit more than having an espresso after 4PM, but on most days, life is pretty sedate. So standing on top of a mountain wearing a helmet and a harness is one of the last places I expected to find myself. This is an idea I would never have come up with on my own. I was home for a short visit with my parents. Mom woke up on her 60th birthday, and we asked what she wanted to do to mark the occasion. I was expecting a shopping trip, maybe a nice dinner out. 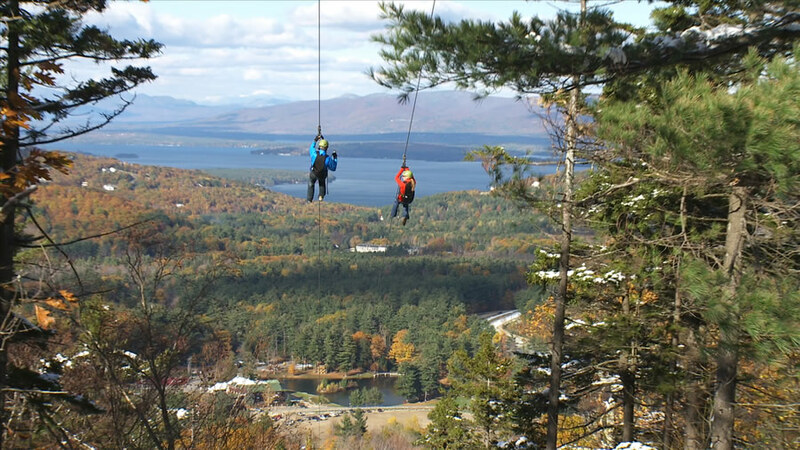 But Mom is a badass, which is how I found myself riding the chairlift to the summit of a mountain with a breathtaking view of Lake Winnipesaukee. I’ve been swimming in that lake my whole life, but had never seen the whole thing at once until a few weeks ago. 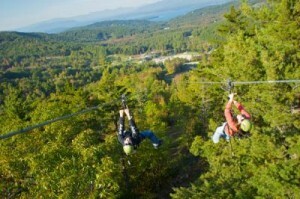 The trip down consists of two zip lines, both of which are about 4000 feet long. Full speed is about 55 MPH, so the trip is over in seconds. But they are some of the longest seconds of your life. When it was over, I couldn’t stop laughing. Had we really just done that? Damn. Then we all went and got ice cream, which is a little bit more my speed. Wow. All this vicarious craziness makes me want an ice cream. Such cool pictures!!! I am resolutely not an adrenaline junkie but zip lines for some reason I can’t figure out sound possibly like a lot of fun. How fun and scary! So wouldja do it again? I noticed that the other guy went much faster than the camera guy. Do those things have a speed control or brakes? Zip Zip Hooray! I love ziplining – thanks for this most excellent recap of your adventure! And ice cream does sound good right about now, too. J-Man: In the video you can see the riders hanging on to a little wooden handle. If you apply no pressure, you don’t move (or you brake to a stop). If you pull down all the way, you reduce all the drag and go at full speed. I am glad there were two long rides, because after trying the first one, when you realize you aren’t going to die, you can use less brake and really let it rip. The guides told us this feature comes in handy if/when a person passes out on the course, since he comes to a stop and is more easily rescued just hanging by his harness. Nice. But really, there’s very little risk beyond losing your sunglasses.